There are times when we all like to revert back to childhood. Actually being encouraged to take naps, being able to watch cartoons without criticism, and bubble baths are all things that belong in every adult’s life! Wait, did someone say “bubble bath”? It’s probably been quite a while since your last one. Perhaps you just forgot they existed, or maybe your last one was less than memorable. Whatever your reason, we’re sure that the best bubble bath shower gels will change your mind! Now that you’ve had the chance to take a look at all of the best bubble bath shower gels, you’re probably interested in learning a bit more about each one! Keep scrolling down a bit more, where you’ll find everything you’re looking for! You’ve probably heard of the Puracy Natural Body Wash before, and if you haven’t, strap in, because you’re in for a ride! The non-toxic body wash is SLS-free, and the Texas-based company makes sure that all of their products are all-natural and plant-based. This makes it not only appealing to those who are very concerned with the products that go into/on their bodies, but also for those with skin sensitivities. Now, while it does say “body wash”, it can also be used as a bubble bath. Simply pour about a handful into the tub as the water is running, and you’ll begin to see some bubbles form. The bathroom will begin to fill with a light, natural, citrusy scent which is more aromatherapeutic than anything. Bring on instant relaxation! The trouble with many bubble baths, is that they’re chock-full of harsh chemicals and artificial fragrances. It’s free of the toxic 12 chemicals, such as: sulfates, formaldehyde, phosphates, petroleum, perfumes, dyes, or animal by-products. So, let’s talk about what actually is included in this revolutionary formula! The doctor-formulated bubble bath substitute is coconut based, which, like many oils, works to smooth and moisturize the skin. Just minutes after soaking in the tub, you’ll start to feel your skin become more supple and soft. Careful not to slip around! It is rather rich, so if you would like to also use it as a shower gel, then you’ll have an enjoyable experience. Just as you may have guessed from the bubbles, it does lather quite well, too. We love how they’ve included Pink Himalayan Salt to act as a gentle exfoliant, too! No matter how you use it, you’ll love how your skin feels afterward! Something that did kind of surprise us, was how thin the gel/bubble bath was. If you’re using it as a bubble bath, this isn’t too much of an issue, but if you’re someone who really likes that thick gel feeling on your skin, you may want to pass. Overall, we loved how well it cleansed our skin, and left it feeling clean, while keeping it soft, smooth, and well-hydrated. The scent was definitely not overpowering, and was actually a nice light, natural addition to the experience. If you’re vegan or gluten-free, you’ll also love the fact that the Puracy Natural Body Wash is, too! It’s also certified cruelty-free, and never tested on animals. In fact, it’s so safe and gentle, that it can even be used on pets and children, if you feel inclined to do so! We know what you’re thinking – that’s not a body wash! Okay, so it’s not your typical body wash, but it does work amazingly as both! 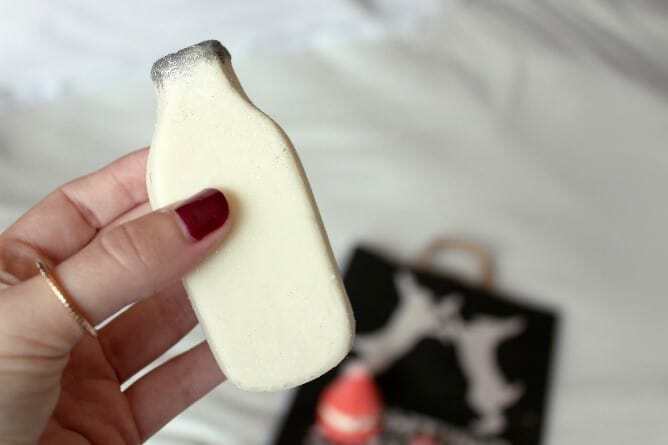 The Lush Milky Bath Bubble Bar is easily the most adorable, innovative bubble bath bomb out there, but it also leaves your skin feeling amazing. At first glance, you can see that the bar is formed to take the appearance of those old milk jars that are so charming and kind of reminds you of being on a farm somewhere, away from errands and pushy bosses. The bubble bath is made with Fair Trade Cocoa Butter, Orange Oil, Patchouli Oil, along with Citronellol. While you can see why it’s so hydrating, you can probably also tell by the ingredients that it’s pretty fragrant! It’s an interesting combination of citrus and Cocoa Butter, but somehow it works for us. However, if you’re not a fan of Patchouli or Citronellol, run away! We actually expected it to smell more like vanilla or have a kind of “milky” scent to it, but we were rather surprised. Another thing we were surprised with, was how it came apart in the water. 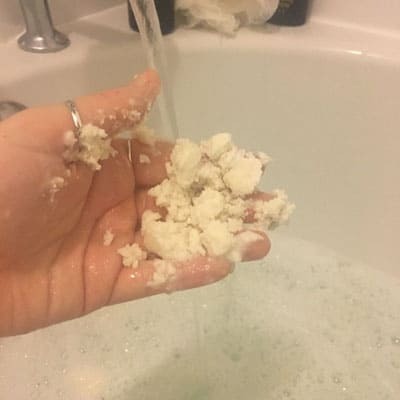 Rather than the “bomb” effect that Lush is known for with their bath products, this one rather melted. It did give off a ton of bubbles, and was inviting us to jump right in. Make sure to keep the water running until you’re all set to get in, because if you don’t, the bubbles won’t form properly. All in all, it’s definitely the best bubble bath for bubble formation! Our skin instantly felt soft, smooth, and supple, and that’s definitely due to the inclusion of the Cocoa Butter, as well as the Soya Milk Powder. It felt more soft and nourished after just one use. 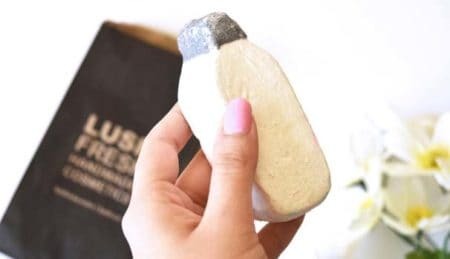 What’s more is that just like all other Lush products, it’s free of harmful ingredients, and they’re never tested on animals! Have you ever wondered what a bubble bath in England feels like? 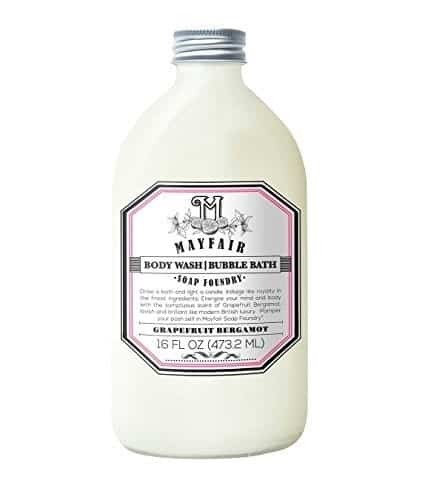 The words “royal” and “luxurious” may slip into your mind, and if we’re talking about the Mayfair Grapefruit and Bergamot Body Wash/Bubble Bath, you wouldn’t be wrong. “Melding posh British sensibility with modern design, Mayfair Soap Foundry is a refined assortment of luxury bath and body care products crafted with premium ingredients, sophisticated scents, and a giveback philosophy”, is how they describe their own brand, and it honestly sums it up pretty well. The bottle itself is reminiscent of the old glass milk bottles, while the label is very British in style. It makes us think that the product it holds is very milky, itself. Upon opening it, we find that it’s actually very creamy, and feels absolutely wonderful against the skin and in the hands. We had a bit of a hard time parting with it when we started the water to the bath. 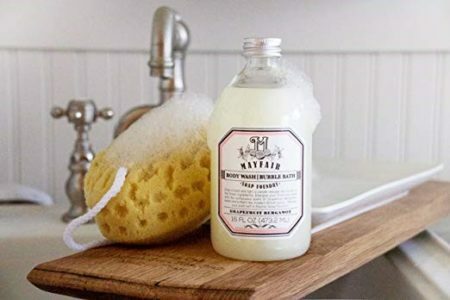 Once the bath starts going, the citrusy Grapefruit/Bergamot scent took over the room, however, we also noticed the Magnolia and Carnation notes were present, giving a sophisticated air to the experience. 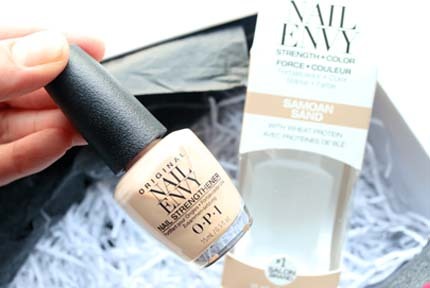 The product is free of parabens and phthalates, and is also cruelty-free. We loved that we didn’t have to worry about any of that, and could enjoy it fully and guilt-free. The bubbles it forms are very sturdy and “thick” if that makes sense. They don’t waver nor thin out just after a few minutes, like so many other products do. How does it make the skin feel? Not only does it cleanse thoroughly, it also leaves skin feeling soft and lightly scented – just enough to give you a pleasant reminder of the bath affair that just took place. The fact that quite a bit of product is required to get a lot of bubbles. While it is effective, you may only want to do this if you take baths sparingly. 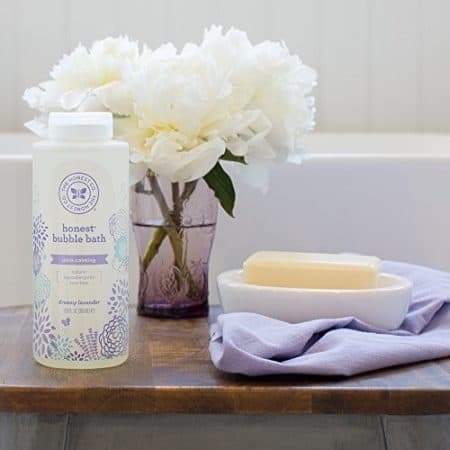 Honest Bubble Bath is definitely one of the most well-known bubble baths for adults out there today, and for good reason! The bath product comes in four different formulas: Perfectly Gentle, Ultra Calming, Deeply Nourishing, and Purely Simple. The Perfectly Gentle features sweet orange and vanilla extracts, Ultra Calming features Lavender essential oils to calm and relax, Deeply Nourishing is made to soften and condition skin, and Purely Simple is fragrance-free and perfect for those with sensitive skin. We went ahead and reviewed the Lavender Ultra Calming version, and after we took a nap, we wrote this review! 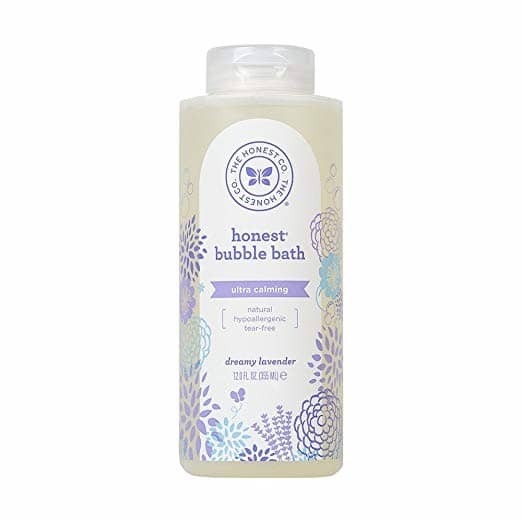 First off, we loved that the Honest bubble bath is plant-based. That means you don’t have to deal with any harsh chemicals. It’s also hypoallergenic, making it gentle and mild, and perfect for dry or sensitive skin. Despite that, it produces some pretty impressive, super-foaming bubbles, which work to cleanse the entire body as soon as you step in. However, we know kids love bubbles too, so if you’d like to use it with them, the tear-free formula is here to the rescue. It makes bath time fun, while also keeping your children clean and smelling good (which is underappreciated before you’re a parent). Not only that, but due to the inclusion of Lavender essential oil, it works to calm and relax. That makes it perfect for you to kick back and unwind after a long day, and also great to use on kids amped up at bedtime! In addition, it’s made without: SLS, sulfates, parabens, synthetic fragrances, dyes, formaldehyde donors, MEA, DEA, and TEA. So, what didn’t we like? If you don’t like Lavender, you’re simply not going to be a fan of this one. It does have a very strong scent, like most of the others do, as well. If your children are getting jealous of your bubble bath time, then why not share with them? 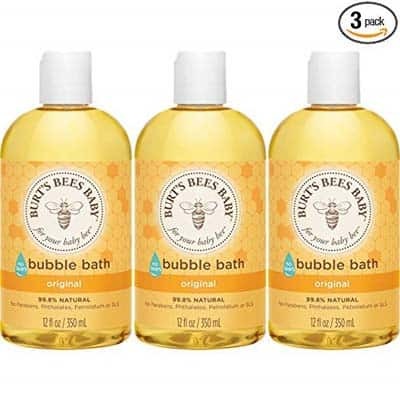 The great thing about the Burt’s Bees Baby Bubble Bath, is that it’s perfectly formulated for babies to get clean, smell great, and have a fun time all at once! This three-pack is also great if you’re looking to save some money while investing in a good product that lasts a long time. Most of us have already heard of Burt’s Bees before. It’s a company that’s well-respected, and known to consistently produce health and body products that are all-natural, safe to use, and also smell and function well. The Baby Bubble Bath is no exception here. In this case, the bubble bath is 99.8% natural, which is pretty much as natural as you can get without the product spoiling on the shelf. While we have a feeling these things are flying off of the shelves, it’s just realistic to not have it be 100% all-natural. Oh, and did we mention that it’s not only a bubble bath? That’s right – it’s actually a shampoo, a baby wash, and a bubble bath! That makes it even more affordable, as you don’t even have to buy separate products. 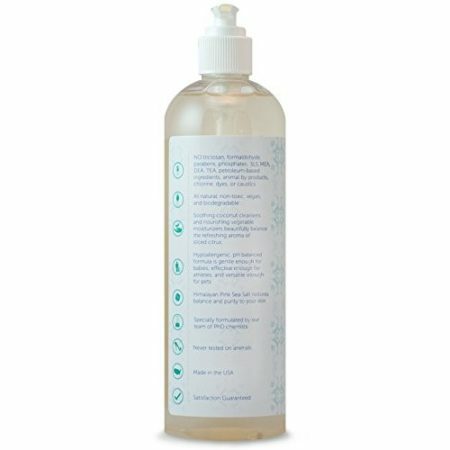 The product is made specifically for delicate baby skin, so you can rest assured that the formula is very gentle, yet effective. It helps soothe and nourish stressed skin during pregnancy, too! The mild formula is made from a moisturizing complex of coconut oil, sunflower oil, as well as soy proteins. Now that you’ve had a chance to read all about the best bubble bath shower gels, you may have already selected the best one for you and your needs. However, if you haven’t, that’s okay, too! That’s why we’ve gone ahead and created this buying guide, so you can be positive you have the best one for you. Most of us base a lot of our likes and dislikes on the scent of things. That’s actually part of the reason why our senses of smell were invented, after all! We don’t want to eat or consume in any way, things that we don’t like the smell of. No matter how good your bubble bath makes your skin feel, or how big the bubbles get, if you don’t like the smell, you’re just not going to want to use it. No one wants to smell unpleasant to themselves, right? So, it’s important that you select one that has a scent you know you’ll be partial to, or one that doesn’t have a scent at all. Most of the products listed above have very natural, mild scents, however, the lavender one is a bit more pungent. Think about a budget before you start shopping – even if it’s just online. Think of a number where you absolutely don’t want to pass, and try not to. There are plenty of affordable bubble bath shower gels out there, just waiting to be placed in your shopping cart! You just have to know which ones to look for. Actually, pretty much every single one of the body wash bubble baths we’ve selected are budget-friendly. Of course, that also depends on your personal budget, but we guarantee there is something on our guide to fit your needs. What do you want to get out of your bubble bath? Do you want it to literally just give you a fun bubbly time or do you want it to be scented and hydrate and nourish your skin? Do you want to be able to use it as more than just a bubble bath shower gel? Perhaps as a shampoo? It’s definitely possible – you just have to know what you’re expecting out of your new product. How bubbly do you like your bubbles to be? Do you want little more than a lather? Do you want a full-on bubble jungle where you may get lost if you don’t have your compass with you? Bubble baths aren’t guaranteed to provide you with the latter, so make sure that you know once again, what you’re expecting. Most of the ones on our list provide thick, dense bubbles, but make sure to read the descriptions! Now that you’ve read pretty much all you need to know about bubble bath shower gels, have you decided on which one is the right one for you? 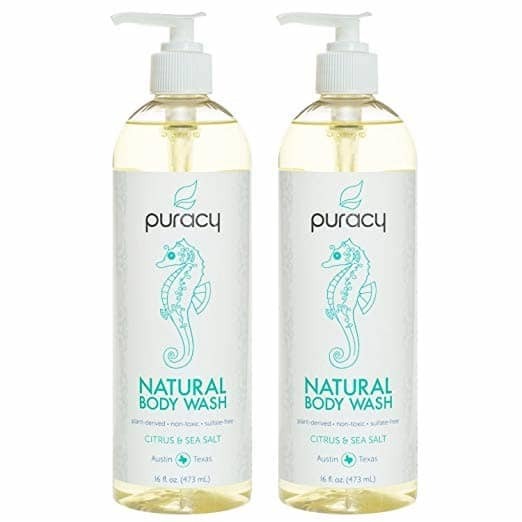 If you haven’t, allow us to reiterate how much we loved the Puracy Natural Body Wash.
It’s inexpensive, it’s all-natural, organic, and free from the 12 main harmful chemicals that are in many competitor products. Not only that, but it works to nourish and condition the skin with ease, and can easily be used as a bubble bath just as well as a shower gel. It works well with adults and children, too! Did we mention it’s vegan and cruelty-free? Aside from that, we also thoroughly enjoyed Lush’s Milky Bath Bubble Bar. First of all, the presentation is absolutely adorable with the milk bottle design, complete with the glitter “cap”. It smells delicious, although, quite fragrant. It also is made with Free Trade Cocoa Butter and Soya Milk Powder, working to make the skin ultra hydrated, smooth, and soft. It’s pretty inexpensive, and makes for a fun bath time with the really thick bubbles! So, which one of these best bubble bath shower gels will be making its way into your bathroom?